screws and pipes with minimum deformation of the broken part. These extractors will not chew up or expand the object being removed. 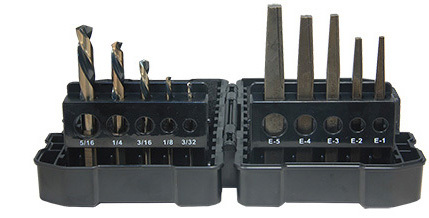 Sizes: EX 1, 2, 3, 4, 5 + 3/32", 1/8", 3/16", 1/4", 5/16"
Ideal for removing broken studs in tight areas. Left–hand spiral drills often remove bolt without the needs for an extractor.